Our Market Value Pricing philosophy means you receive a no-haggle, no-hassle purchase experience, and provides you with peace of mind knowing you are getting our best price upfront. For many years Gorrud’s Auto has been synonymous with peace of mind and we have always looked for ways to be different and enhance our customer’s purchase and ownership experience. 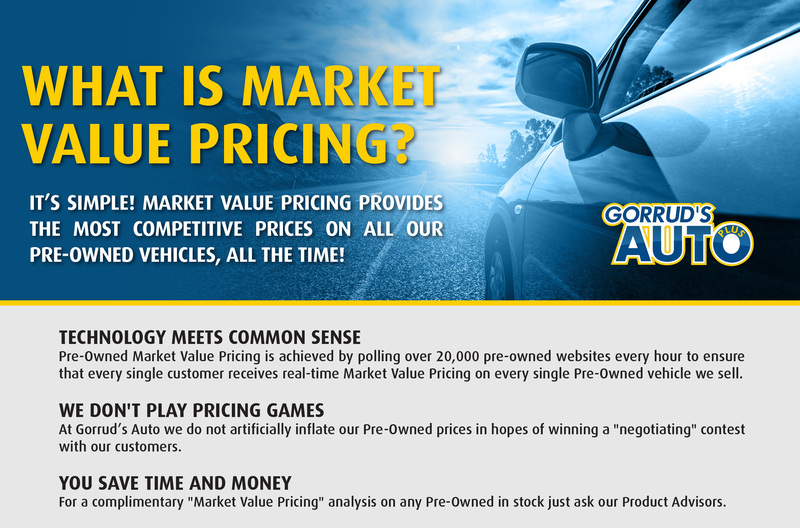 We respect your time, and by providing our unique Market Value Pricing approach, it’s just another way Gorrud’s Auto strives to be different. Prices are clearly posted on our website, on our lot, and everywhere we advertise our vehicles. Plus, our prices are 100% transparent with only taxes being extra, unless otherwise noted. Quite simply we listened to you. For years our customers told us they wanted a shorter and simpler purchase process. A process that respected their time, eliminated pressure and took away negotiation, the number one most dreaded component of the purchase process. At Gorrud’s Auto we make it easy. You don’t have to negotiate price or sit around the dealership while we work numbers behind the scenes. You deal with one person for the majority of the transaction and, best of all you don’t have to negotiate to get a great deal. We always put our best price forward immediately. Gorrud’s Auto Warranties & Guarantees included in Market Value Pricing. Our Market Value Pricing includes Gorrud’s Auto’s industry leading Warranties and Guarantees and also includes complimentary enrolment in our unique Auto Rewards program. Gorrud’s Auto pioneered the concept of No-Risk Purchasing and many years later, our 30-Day Exchange policy continues to be one of the main reason people choose Gorrud’s Auto. That’s right. If you are not satisfied with your purchase, for any reason, simply exchange it for a vehicle of equal value at no charge. If the vehicle you are exchanging for is of greater value, you only pay the difference. Now that’s peace of mind! The used vehicle professionals at Gorrud’s Auto have many years’ experience and the most modern technology available to ensure all of our vehicles are priced competitively. Our Market Value Pricing philosophy does not mean all vehicles are priced the same. Many factors, including supply and demand, reconditioning, a vehicle’s colour and unique features, all impact the pricing of a vehicle. The overall appearance and mechanical reconditioning process will also be a contributing factor to price.